Interactive HTML5 and ePub3 content play a key role in various fields such as training, e-learning, interactive documentation, and many more, which explains the increasing number of organizations turning to HTML5 & ePub3 ebooks. That is when they need a competent and trustworthy HTML5 & ePub3 ebooks development partner such Allied Infoline. Having worked with leading enterprises, publishers, institutions, e-learning service providers, libraries, learning groups, authors, and various other clients, we have garnered comprehensive expertise to deliver high-quality interactive ePub3 and HTML5 ebooks compatible with diverse readers, operating systems and browsers. Following a collaborative approach, our HTML5 & ePub3 developers devise a delivery strategy that is precisely aligned with the requirements of our clients, and are ideally positioned to handle any large-volume conversion project, no matter the complexities or challenges. Whether your source files are in MS Word, Quark, HTML, PDF, RTF, InDesign, XML, or any other format, we can convert it into interactive HTML5 and ePub3 eBooks, optimally incorporating a spectrum of leading-edge multimedia features. 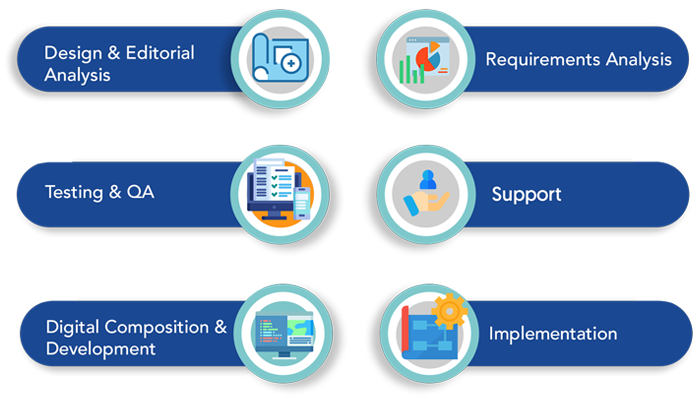 When it comes to choosing an outsourcing services partner for HTML5 & ePub3 eBooks, you are bound to have certain questions and concerns. To discuss your requirement or learn more about our HTML5 & ePub3 ebooks development services, fill out our contact form and we will take it from there. You can also write to us at sales@alliedinfoline.com.